Going into this weekend’s MANCUP race, here’s an overview of how the major battles are shaping up going into the last race of the season at South Georgia Motorsports Park. Larry “Spiderman” McBride and Dave Vantine aim to make history again. 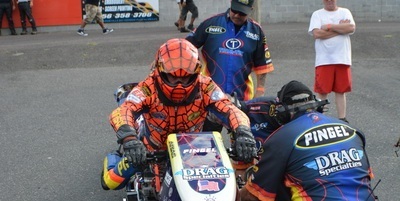 In the Pingel Top Fuel series, Larry “Spiderman” McBride, racing in his 34th season of Top Fuel bike is ahead of the pack, but both Dave Vantine of the Pollard Nitrosports team and veteran Chris Hand are within striking distance of taking out McBride. Larry will have to earn yet another championship, there’s no room for mistakes in Top Fuel motorcycle. Dave Vantine is settling in with the Pollard Nitrosports bike and has recorded several five second time slips in match racing events this season. Beware the yellow bike in Top Fuel, they are capable of stealing the show this weekend. Top Fuel Twin racing in the MANCUP series for 2014 has been almost non existent due to the big dogs chasing points in the NHRA and IHRA championship series. Going into this weekend’s race, Rocky Jackson of LA, is the only Top Fuel Nitro Harley listed as having accrued points. While he has a 99 point lead over racers who show up this weekend, knowing that heavy hitters Tommy Grimes and Richard Sharkey are due to arrive, Rocky may be in for a rocky weekend at SGMP. The APE sponsored, Pro Comp class, with 27 points members chasing the championship, is led by veteran Bill Vose who’s 18 point lead over Paul Gast is a slim one. Billy will need every round of racing to go well for him to secure a championship on Sunday. Travis Davis is not far behind the leaders, so really this one’s a dog fight. It will be interesting to see who Jay Eshbach of APE awards the trophy to after the final round. Pro Fuel class, sponsored by Hawaya Racing, courtesy of Johnny Vickers, shows only nine racers chasing points, but rumor has it close to twice that number of racers and bikes will show up at the World Finals. Dale Nilles leads the pack with 208 points and is likely to defend his 2013 championship of the class, but with a big field of fuel Harley’s racing, anything can happen. Dale is more than capable of defending his title, but he will have to fend off, Johnny Vickers, Janette Thornley, Howard Wiggins, Rebel Glover, Steve & Clint Pleasant, Walter Holinski and who knows who else will show up! 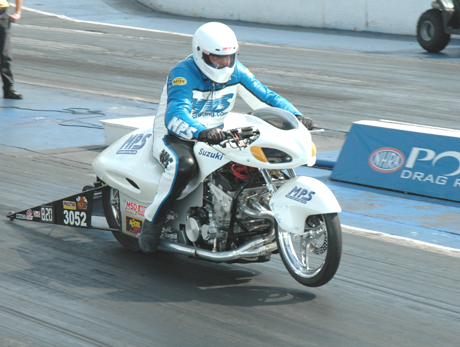 There are five to seven NEW racers entering the nitro Harley P/F class every year. T/F can only wish they had the growth of the P/F class. The Cooper Performance Pro Open class has 18 racers listed in points, and fifteen of them entered the first race of the season won by John Bullock. Since that first race, class participation has been spotty, but in the first year of a new experimental class, this is expected. Let’s face it, racers who enter into Pro Open know that while you could be seated on a six second P/F bike, a Pro Stock Buell or a P/St. bike may just sneak in on race day. Currently Rob Giard on a Funny Bike is the points leader, but he’ll have to qualify well and survive round one to secure the first championship in the inaugural season of Pro Open. In the smack talk’n, big balls, no-bars racing class known as Pro Street, sponsored by Orient Express racing, Joey Gladstone has a sizable lead over Ryan Schnitz, and Joey is likely to just turn it up at SGMP. Unless the planets really line up against Joey going into this weekends race, there’s no stopping him. The Real Street class sponsored by Shinko Motorcycle Tires, has a great clash of titans headlining their show. 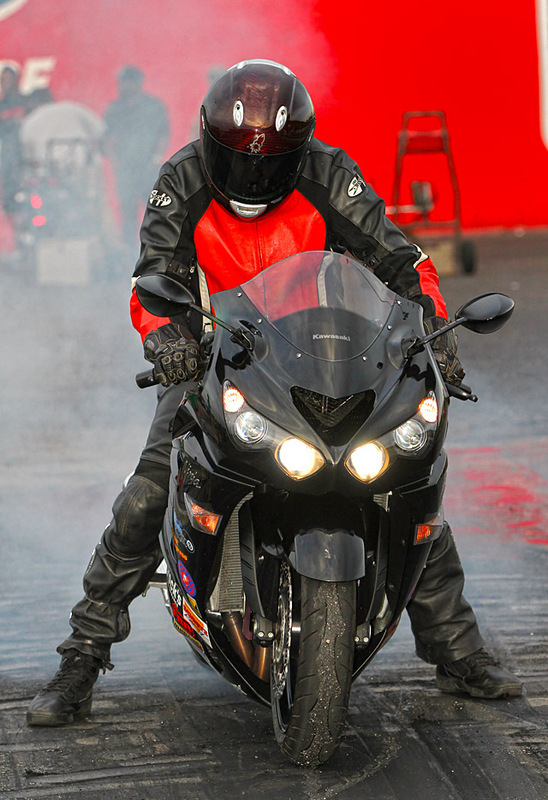 Only two slim points separate class leader Jeremy Teasley from follower Rickey Gadson. Add to this the very dangerous John Dobrin is only three points behind Gadson and it’s easy to see this is the class where the driver is everything and ice water in the veins is mandatory. On Sunday, it’s anyone’s race to win but to be victorious here will take mad driving skillz and stone cold emotional control. Star Racing’s “Top Gas” class will be a battle as it is every race for the sportsman racers. With over fifty racers in the points race and it’s not uncommon to see that many in the staging lanes at a MANCUP race, to win it all in this class takes a high degree of skill AND endurance by racer & machine. Top dog going into the MANCUP World Finals is Garrett “Pe-Wee” Carter, with John Schwartz only 6 points behind him. With so many rounds of racing ahead of these racers, it’s not the size of the dog in the fight that matters here, it’s the size of the fight in the dog that will win this championship. When Jackie Bryce of Star Racing awards the plaque at the conclusion of racing, she knows full well she rewarding a racer who’s truly earned it. The MTC Engineering Super Comp class with over sixty racers in points is led by Scott Delong who leads Dan Cusimano by only 5 points. This popular index class will be a round by round survival match that will be likely be decided under the lights on Sunday night. Once the sun goes down and the track goes from sticky to tricky, the real racers skills come to the front. It will be late in the day on race day before Eric Hochstetler of MTC will award this championship come Sunday night. Crazy – 8’s, the breading grounds for future Pro Street racers is a class sponsored by Dave Conforti and his company World Wide Bearings. The top three points leaders is a who’s who of big league sluggers: Doug Gall, Jeremy Teasley, and Bob Carlson. Any one of these three can win this championship on race day. I pity any racer that gets in their way on Sunday during eliminations. Bob Carlson has not had a season to his liking this year and he’ll be out for blood all weekend. There’s no friends on the starting line, believe me on race day. 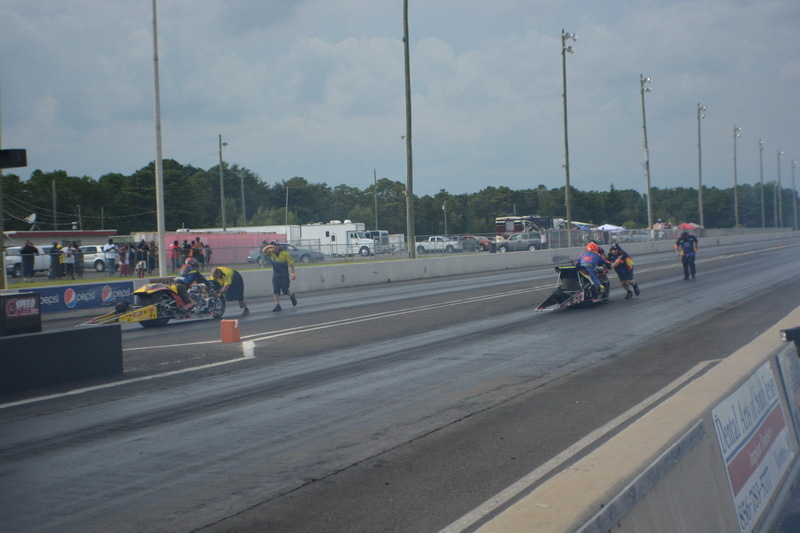 The Wiseco Pistons, Street Fighter class, like the sportsman classes before it, is heavily populated and points leader Butch Million is ahead of follower Baybay Yarbrough by 7 points. And twelve points behind Baybay is Doug Gall. Tune up and no fear will lead to the late rounds of racing where the real racers are. Look for these names after dark on Sunday. One of them will emerge as the best of the best in St/Ft class. The D&G Chassis sponsored V-Twin class of MANCUP racing is headed by Justin Collier with a 13 point lead going into the last race of the season. Justin, a veteran Harley gas racer, is as skilled at building gas powered racing Harley’s, as he is at driving them. While thirteen points is not a big lead over second place Clint Riley, unless a parts problem bites Justin in the back side, he is headed for his first MANCUP points championship. This one should go according to script. MPS or Motorcycle Performance Specialties who sponsors the MANCUP Pro ET class will be a while in awarding it’s championship on Sunday. In one of the heaviest populated classes of MANCUP racing where 100 entries are not uncommon, it takes a while to go through the ranks of racers to advance to the final rounds. Luc David is 45 points ahead of Tim Hunt going into the race, but with so many rounds of racing to get to the final round, a lead like that can evaporate quickly. Add to the fact that Bob Carlson is in third place rabid for BAMF points, no one is safe here. Dan Rudd who founded MPS in 1980, knows a few things about Sportsman racing, knows it will be a long day for him on Sunday before he makes his way to the winners circle to award the championship plaque. Muzzy’s Street ET class with over 153 racers listed in points is the most populated class of MANCUP racing. Brandon Cunningham leads the pack with 288 points followed by Ron Arnold holding 275 points, who has an ominous dark shadow at 262 points owned by Bob Carlson awaiting the chance to pounce upon any mistake by either racer. Come Sunday, late Sunday, photographers will need a flash on their cameras to shoot winners circle shots when the dust clears. There is no way to foresee who will win the championship in this class in advance. But one thing is certain, who ever wins the class championship, they damn sure earned it.